I love eating salads all year long, and in the winter months I love to add a warm element. The Gorgonzola sauce is heated just enough to melt the cheese – didn’t you say you were going to eat more salads in 2016? Heat a large sauté pan to medium high heat and add 1 tablespoon each of butter and olive oil. Add the mushrooms and season with salt and pepper, and stir from time to time. Sauté until they are golden brown and remove to a plate. Add the additional butter and olive oil and season the chicken breasts, sauté them for about 3-4 minutes each side or until just cooked through. Let the chicken breast rest while you heat the sauce. In a small sauce pan combine all the Gorgonzola cheese sauce ingredients and heat over low heat just until the sauce warms and becomes smooth, leaving a few lumps of cheese. To serve line a plate with torn butter lettuce and top with sliced chicken and mushrooms, drizzle with the sauce and finish with the last of the crumbled Gorgonzola. 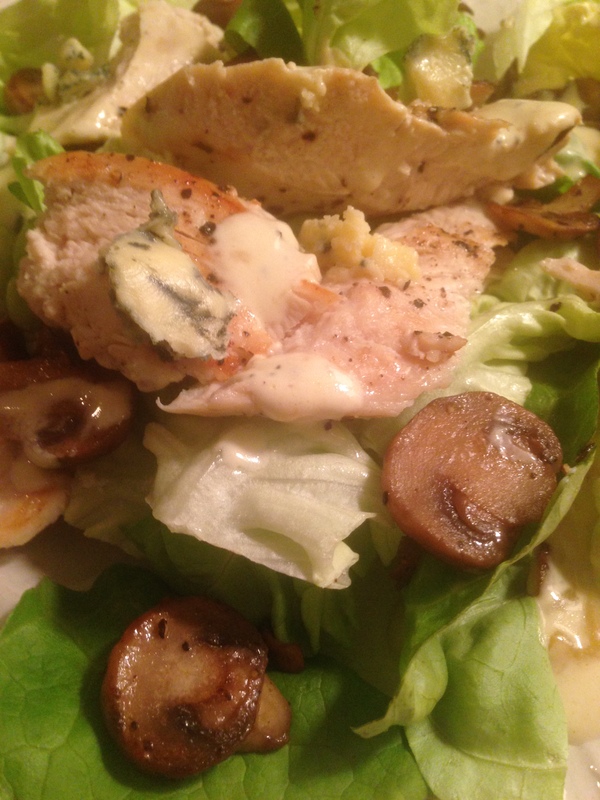 This entry was posted in Recipes and tagged chicken, Gorgonzola cheese, mushrooms, salad. Bookmark the permalink.